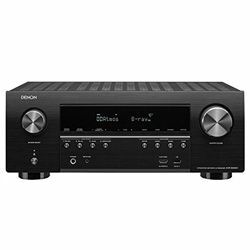 This powerful 7.2 AV receiver belongs to the middle segment. It provides multiple options for controlling the unit’s operation, while equalization opportunities are not vast. The device sufficient gear to maintain the modern UHD technology and multi-dimensional sound. Learn the details in this Yamaha RX-V579BL review! The unit has an expensive touch, while the design is pretty straightforward. Simple rectangular shape, tiny buttons are in the front. There are many connection ports as well, including the one for Phones and AUX. The rear panel has a good onset and comprehensive labeling. The minimalist and informative remote is notable for unusual inputs’ shifting and volume controls. The dual zone support is the primary feature of this receiver. The 7-channel signal can be split and sent to 2-channel Zone B. However, there is no possibility to diversify the content for two zones, as they have the same output. And it doesn’t support the independent Zone B’ playback. The independent playback is possible via MusicCast Multiroom tech, which requires the presence of compatible wireless speakers. 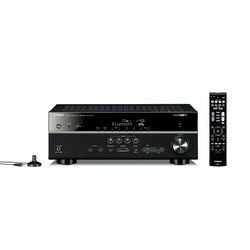 This receiver supports most of the modern video formats including 4K, and provides signal conversion from analog to HDMI, preserving high picture quality. The Deep Color mode brings rich juicy colors to the HD movies. 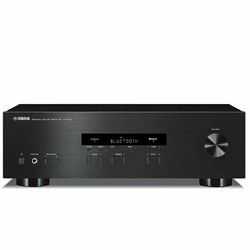 The receiver provides a 115W gain for subwoofers and 80W for other speakers, while the Bi-amplifying function boosts the stereo sound yet more. The clean distortion-free loud sound with the clear outline for every channel is a visit card of this device. The middle line is very dynamic, the highs are sharp and interference-free. Solid separation of subwoofers connections leads to the thunder-like rocking bass. The receiver supports Virtual Surround, which presents quite powerful, echo-free audio and pure transmission to headphones. 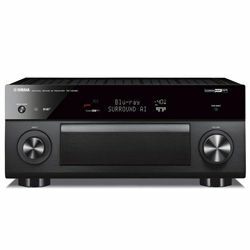 The physical connection set is standard for this type of AV receivers. However, the wireless provides numerous options. Built-in Wi-Fi and Bluetooth enable immediate quality streaming. The streaming apps are presented in full version, with all the controls and menus available. I also paired it with Alexa to obtain voice control. Though not fully functional, it makes a good addition to the smartphone app. Setting up the system and performing calibration takes time with this receiver, as it provides lots of menus without clear transitions, not too user-friendly. Still, once tuned the system preserves the settings and does not require further adjustments. 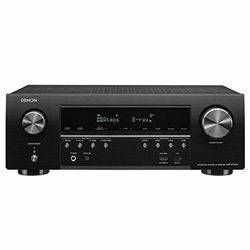 The penetrating physically touching sound is the “visit card” of this solid middle-priced receiver. The surround sound is not available in full functionality, while the headphones surround is of premium quality. The unit is notable for its reliable connectivity and multiple streaming options.